Here’s a look at what’s new in March. New features and services give you more ways to collaborate with colleagues and LinkedIn connections across platforms. Boost meeting productivity and meet compliance obligations with Microsoft Teams updates—Last week at Enterprise Connect, we announced several new features in Teams including the ability to improve the effectiveness of remote meetings by replacing your background during video chats and increasing inclusivity with live captions & subtitles during Teams meetings. We also announced the generally availability of live and on-demand events in Microsoft 365, which enable you to deliver compelling communications to up to 10,000 employees, customers, and partners. We also announced new compliance capabilities in Teams such as Data Loss Prevention (DLP) in chats and conversations to help you keep information secure and meet your obligations. Improve whiteboard ideation and collaboration—Two new intelligent inking features in the Microsoft Whiteboard Windows 10 app help improve the collaborative ideation experience. Now, you can easily capture a picture of a physical whiteboard and convert it to digital ink in the Whiteboard app using ink grab. Additionally, the new ink beautification feature can help increase the readability of jotted notes by analyzing handwriting and automatically replacing it with more legible strokes. Together, these intelligent inking features decrease the time spent on managing content, so you can spend more time collaborating on a digital whiteboard. Both are now available in the Whiteboard Windows 10 app. Work seamlessly with first-degree LinkedIn connections—When you securely connect your LinkedIn account with your Office 365 account, you can now view others’ LinkedIn profiles in Outlook on the web, and in OneDrive and SharePoint in Office 365, and see relevant insights about the people you’re working with, both inside and outside your organization. Now rolling out to Targeted Release customers is the ability to send emails to and coauthor documents with many of their first-degree LinkedIn connections. To get started, type a connection’s name in the To or Cc field when composing a new message or sharing a document in Outlook on the web, OneDrive, SharePoint, Word Online, PowerPoint Online, and Excel Online. New Word, Excel, PowerPoint, and Outlook on the web features help you create beautiful content and save you time. Make your presentations stand out with 3D objects on your Mac—Create stunning visuals and engaging content on your Mac with 3D embedded animations in Word, Excel, and PowerPoint. Improve comprehension and retention, increase engagement, and entertain audiences with content that seemingly comes to life. Select scenes and insert 3D models from a vast library of free content and rotate 3D objects to tell your story from every angle. 3D objects on Mac will start rolling out to Insiders next month. 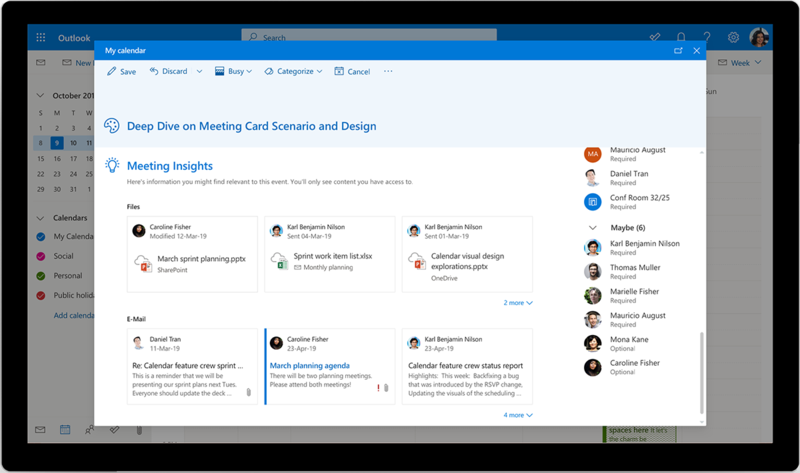 Prepare for and schedule meetings faster with new intelligent features in Outlook on the web—Powered by Microsoft artificial intelligence (AI), Outlook on the web will now help you prepare for meetings by showing you relevant information you might need. It will also automatically suggest that you create a meeting directly from an email conversation and show you available days and times for people you include in a meeting invite. These features will begin rolling out to Outlook on the web users in the next few weeks. New capabilities help you better protect your organization and streamline IT management. Ensure a healthy security posture with updates to Microsoft Defender Advanced Threat Protection (ATP)—Last week, we announced that we’re extending our endpoint protection platform to support additional operating systems with Microsoft Defender Advanced Threat Protection (ATP) for Mac, available now in limited preview. With this expansion, we’re also renaming the Windows Defender ATP platform to Microsoft Defender ATP. We also announced that we’re making Threat and Vulnerability Management (TVM) capabilities available in Microsoft Defender ATP to discover, prioritize, and remediate threats and vulnerabilities—preview coming soon. 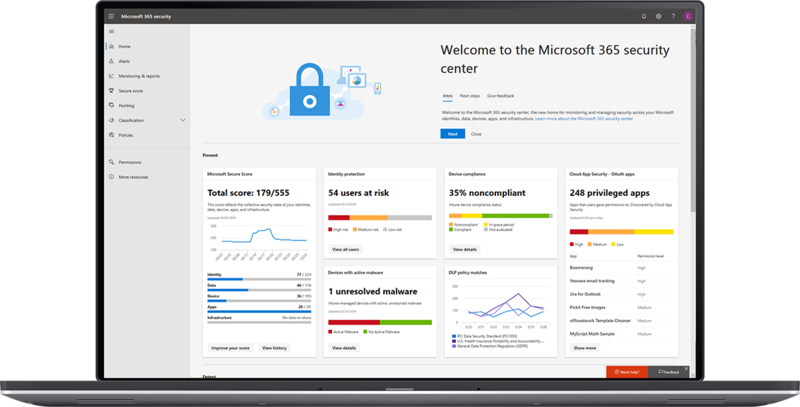 Access your security and investigation tools in the new Microsoft 365 security center—The Microsoft 365 security center is a new unified security experience that provides your security professionals with a dedicated workspace to manage and take advantage of the comprehensive security capabilities of Microsoft Threat Protection. 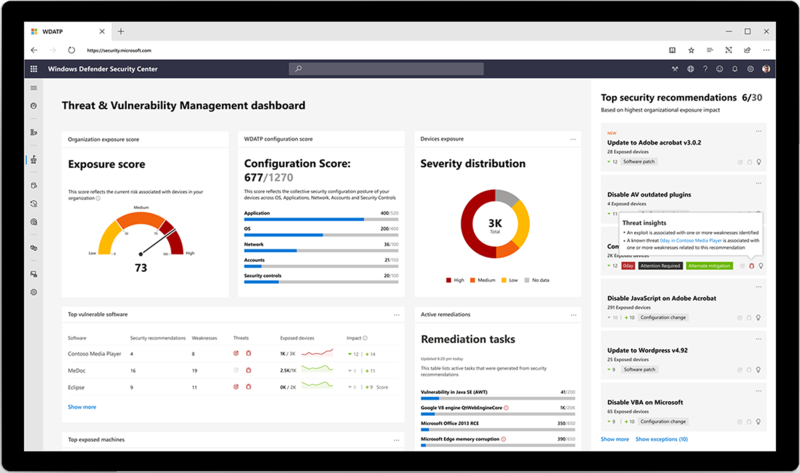 The Microsoft 365 security center is now generally available. 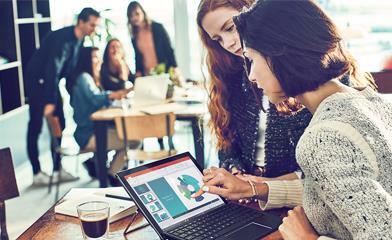 Get started with features and capabilities such as Secure Score, Advanced Hunting, and security alerts by visiting security.microsoft.com. Manage your Microsoft 365 services with the new Microsoft 365 admin center—Last week, we announced that the new Microsoft 365 admin center will begin rolling out as the default experience for all Microsoft 365 and Office 365 admins. 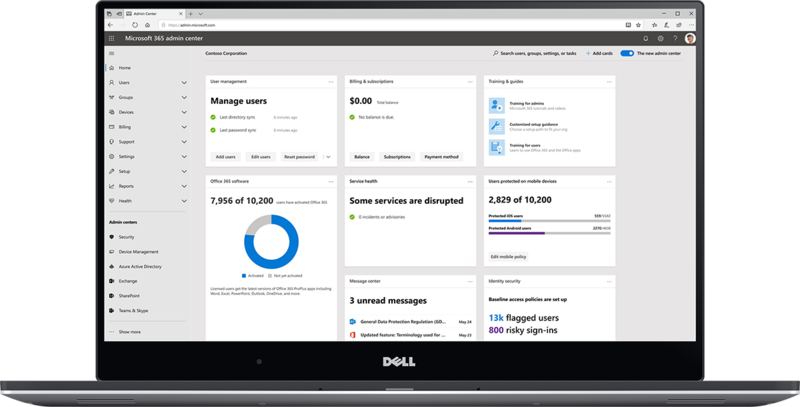 The Microsoft 365 admin center is designed to serve as a single entry point for managing services across Windows 10, Office 365, and Enterprise Mobility + Security (EMS) in a more powerful, efficient, and personalized way. Now, when opening links to Office 365 documents from the Word, Excel, PowerPoint, or Outlook desktop apps, you will have the option to open them directly in the desktop apps instead of the web. Teams users can now add a Yammer tab to a Teams channel that loads a specified group or topic feed from Yammer. Microsoft Forms Pro, our new enterprise survey solution to professionally distribute surveys, is now available in public preview. OneNote now supports syncing edits of files embedded in your notebooks, eliminating the need to save copies of embedded files. The custom policies feature in Azure Active Directory B2C is now generally available and gives you more control over identity experiences to help you deliver personalized user journeys in your customer-facing applications.